Peregrine comprises of a number of niche financial services businesses in which it holds either significant management control or ownership. Through three of its subsidiaries - Citadel, Peregrine Capital and Stenham - the Group operates in the fields of Private Client Wealthcare, South African and global funds-of-funds and single manager hedge funds. Furthermore, Peregrine houses one of South Africa’s leading derivatives, equity and prime broking operations through Peregrine Securities. In line with the Peregrine growth strategy, the Group acquired 50% of Java Capital, a leading independent corporate finance, advisory and investment business. ​Scroll over or click on the funnel chart to get more details of PGR 31 March 2015 financial results. Peregrine had a pretty even contribution to their total revenues from their four main divisions. As can be seen from the pie chart below. Its encouraging to see that they are not overly dependent on one of their divisions to carry the company as a whole and that all the divisions are contributing. 51% of PGR's earnings is now annuity income (or recurring earnings, basically money earned from fees charged on money being managed by PGR's entities). This bodes well for them as this brings a certain measure of stability in their earnings (making them less dependent on market swings). Peregrine is an extremely strong cash generative business and generated just over R1billion in cash in their last financial year. That amounts to around R5.14 per share that's been generated in cash. 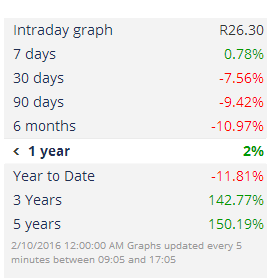 Rand weakness should see strong earnings in Rand terms from their Offshore entity, Stenham. 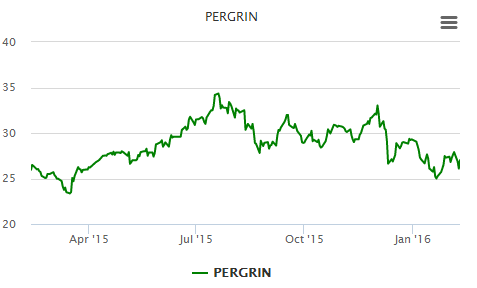 Peregrine has a dividend policy of paying roughly 50% of net income out as a dividend. The graphic below shows the contributions of their various divisions to their revenue and operating profit. The graph is interactive. If you click on any of the division within the pie chart it will shoot out of the pie chart, if you click on the description of the division the graph will either remove or add that division back to the pie chart. If one division is added or removed (it recalculates the contributions and shows it in the brackets).